SurfSelf(. 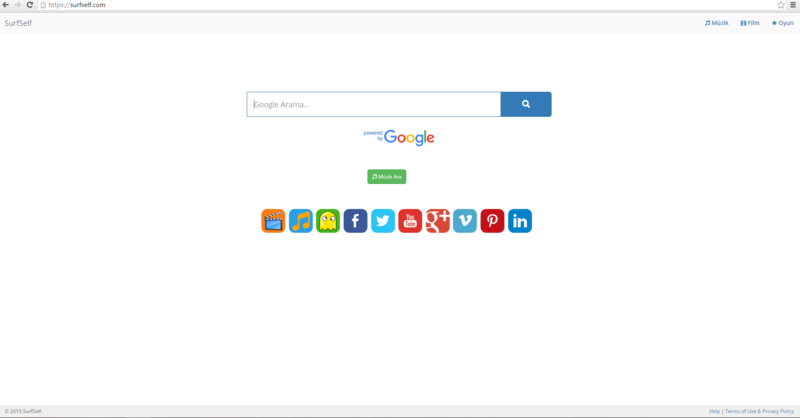 )com is the main page of a browser hijacker. If the homepage of your Google Chrome, Mozilla Firefox, Microsoft’s Edge, or another browser is set to Surfself(. )com, it’s likely hijacked. To learn more about the threat and what you can do about it, read the article featured bellow. You can remove the browser hijacker by hand by carefully following all the guidelines of our step-by-step guide below. Distribution PUPs, malicious ads, bundle packs. Browser hijackers like SurfSelf(. )Com are often distributed through bundled installs. This trick is a popular way to push software that’s either unwanted by or harmful to users. It works like this- a bundle of PUPs(potentially unwanted programs) would be attached to the install file of a program that the user might want on his computer. While installing, the menu would give the user the option to add undesired programs to his computer. These options are often hidden in the Advance or Custom part of the install files and can be missed easily by a non-vigilant user. People who install applications by clicking “Next“ on each step are most threatened to this type software pushing. Another way to distribute browser hijackers is through intrusive ads, of the kind often found on shady websites. Avoid clicking of this type of advertisement, especially if it’s on a torrent tracker, free file-sharing services, pornographic sites, and similar web pages. The design consists of a search bar and a few links. 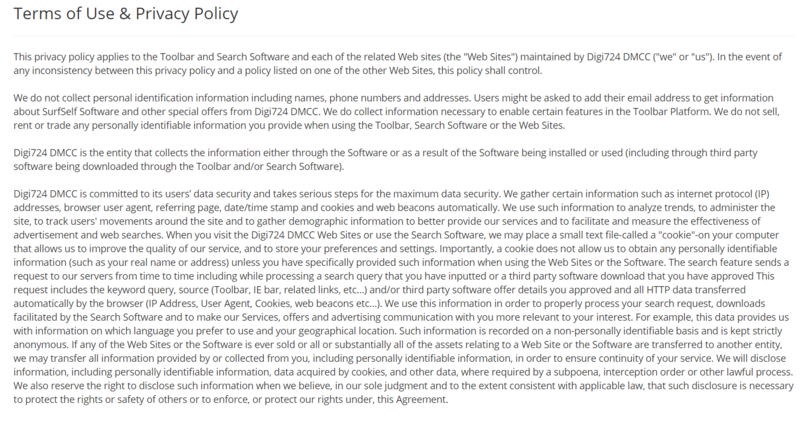 By clicking on them, the user gets a redirect URL –“bit(. )ly.” That’s never a good sign, as it’s very prevalent in hoax search engines. Another fishy aspect of SurfSelf(. )Com is that the site seems to lack its own database, as it uses Google Custom Search. It’s unknown where this information might end up, but it’s sure that you don’t want it in the hands of cyber-criminals or disingenuous advertisers. More signs of a hijacked browser are the installation of a toolbar, a changed new tab page, switched default search engine, and a slower working speed on your PC. In addition to all these malicious “features”, SurfSelf(. )Com could also display excessive advertising, such as pop-ups, banners, etc. There’s no real upside to having a browser hijacker on your computer. That’s why you should remove it as quickly as possible. Removing SurfSelf(. )Com could be tricky, but it’s by no means impossible. To get rid of a hijacker, you should remove all its components from the affected system. That process can take a lot of time and takes more advanced tech skills. You can also install an anti-malware program, which will scan your system and delete any malicious software. Plus, it’ll protect you from future threats. –Multiple operating systems on your computer. This is very similar to booting with a single operating system. Press F8 repeatedly when you see the first boot screen. You just have to use the arrow keys to choose which system you should boot. While you’re in safe mode, your screen will be windowed. A menu should appear after the reboot. Choose Safe Mode by pressing its corresponding key number. The PC will restart and boot into Safe Mode. The “Programs and features” menu should now appear. It’s a list of all the programs installed on the PC. Here you can find the program, select it, and press Uninstall. Follow these instructions and you’ll be able to uninstall it successfully. Go to the Tools menu and click on Manage add-ons. Joseph Steinberg is the editor-in-chief, lead content creator, and local father figure of Best Security Search. He enjoys hiking and rock climbing and hates the 12345678 and qwerty passwords.